My mom called me all excited a couple of weeks ago! She found me a beautiful antique mahogany desk to paint for only….drum roll please….$15! The original plan was that I was going to paint it for her. She couldn't decide on a color so I used one of my favorite two colors that I already had on hand. I had been wanting to try a grain sack look, and I thought this desk would be a perfect candidate! I picked the desk up at mom's. It is a very sturdy beauty with all original jewelry! BUT……ohhhhhh what a job she would be! Quite a few drawer fronts had to have the veneer glued back in place. Did you see the top? Lots of wood filler were used there. BUT the biggest pain, was that everywhere you touched it, red came off on your hands. It was like someone had tried to apply a stain to the top of the desk to make it look better and it wouldn't absorb. It just sat on top and bubbles had formed especially on the drawer fronts. Yuck! Lots of sanding on the drawer fronts and top with the rotary sander. Then because of the red coming off on your hands was such an issue that I decided to prime with not one, but two coats of stain blocking water based primer. GRRRRRR!!!!! I was too concerned with bleed through, and I so didn't want to waste my Annie Sloan chalk paint on multiple coats to cover the stain. One coat of primer turned the brush pink. At this point I am worried and discouraged that this project is going to be a big fat fail! Not exactly sure why I was worried? I am painting with the wonder chalk paint by Annie Sloan! I painted two coats. It fills in cracks and completely covered any remaining pink! I painted the body in French Linen. The coverage is amazing! I've painted several things with that one quart, and I still have enough for another smaller project! I let this dry overnight only because I was tired! I used the above materials to create a wider grain sack look in Old White. I taped off the center stripe to paint first. I carried the stripe down both sides of the desk as well for an overall effect. I painted two light coats on the stripe, but honestly since I am later distressing, I probably could have gotten by with just one. I waited just a couple of short minutes while I put my brush in the fridge and removed the tape. I always pull at an angle away from the just painted part. I waited a couple of hours and then taped up the other two stripes and painted them. Next just a couple of hours later, I started distressing. I kept my vacuum handy with the furniture brush attachment. I vacuumed away any dust as I went to clearly see where I needed to distress. I used a fine grit sanding block. If you are new to distressing with chalk paint, you might get a little scared at first…..I sure was! Notice how in these pictures marked by arrows how the edges of the stripes are ruffed and white from sanding. This goes away when you wax! I continued to distress just the edges of the desk and the edges of the drawer fronts. Distressing is completely up to you. You could distress the sides and top more, but the edges and just the stripes were the look I was going for. After sanding and really thoroughly dusting the desk, I began to wax with clear wax. I did one all over coat on the desk with an additional coat on the top for durability. I prefer applying wax with an old t-shirt. I feel like I have better control and can really work it into the piece. I did two coats of clear wax on the drawer fronts. I had to paint the interior and sides of the drawers in Old White, but didn't want to waste my wax or fool with the whole process. I took the easier and cheaper route and just covered them with one coat of wipe on poly. This is what it looks like all finished. Now to decide where she is going to go! Mom just couldn't decide so it is going in my teen son's room. She really just didn't have the space. So up it went up the stairs with my handy-dandy helpers! I knew exactly where I wanted it to go, but that involved a complete room rearrange that I was NOT planning on….yes more work! The funny thing is that my poor son didn't know this was going on to his room! He is a creature of habit! He doesn't like change and was not happy with the new arrangement. He has learned to put up with his mom and sister's decorating ways! Ashlyn started setting up the lights while I started taking things off the dressers and placing them on the bed. We were not planning on moving the bed, but had to…grrr! This means that I am now going to have to re-hang wall stuff and hopefully not have to paint! I am really liking the new bed arrangement! It is always fun to create a new look with what you already have! Grain sack desk painted in Annie Sloan Chalk Paint in French Linen and Old White with clear wax. It's all in the details! I was able to use all of the original hardware. It was pretty nasty, but cleaned up well. I like that it is really old and looks old!!! Needless to say, I am amazed yet again what Annie Sloan Chalk Paint can transform! My initial fears faded after I started painting the first few swipes with my brush. This desk does look great in my son's room! Now to find a chair……I am thinking an industrial metal chair. Even though this was not a planned room make-over, it looks like there may be a few changes in store! I already have plans for something over the bed. So glad to not have a FatHead over the bed anymore! I think the whole change is starting to grow on Woods. I hope you'll follow along if not already to see how this room comes together! I have several more furniture transformations to share with you! I’ve just painted a desk with AS chalk paint ( the desk top is Melamine) and left it to dry after 3 coats of paint for 3 days. I’ve waxed it and after another 2 days it has bubbled in patches. What can I do? Help please!! Krissie, I am so sorry you have had such a difficult time! I have never painted melamine, but about everything else! I did a little research for you. Here is a clip from: http://www.anniesloanunfolded.com/faqs Scroll down and you will find a Q and A on this directly from Annie’s site. For me….when in doubt….I lightly sand to give the paint tooth. I have also had great success using Zinnser water based primer. Oh I am amazed.I love the desk. You make things look so easy. And with your detailed walk through of your project, I am convinced I to can do this. Thank you for virtually allowing me into your home! Beautiful piece! You have done it once again. I love using ASCP and your desk turned out great!! 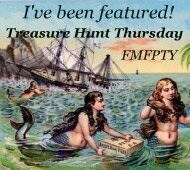 Thanks for sharing at Throwback Thursdays!! Love it! 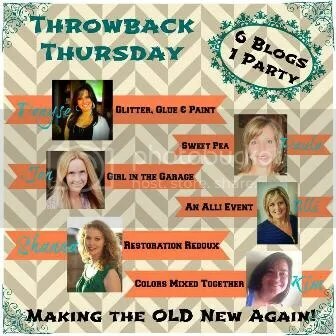 I have been itching to try something with Annie Sloan’s chalk paint. I did just order some Miss Mustard Seed’s milk paint to try on a great old dresser I found in northern Georgia. Must start somewhere, right? I did it and while I really liked the milk paint, I’m not crazy about the end result color. I chose French Enamel, but it just seems to be too much on the dresser. I’m going to live with it for a while and if I still don’t like it may go a completely different direction, such as Linen or Typewriter. And I definitely want to try AS’s chalk paint. Now I just need to find some more furniture to practice on and experiment! Jealous that you got to go to Haven! Sounds like so much fun. So I am ready to paint like crazy with annie sloan. It does seem to be very common to distress everything which I am not sure I like. My question is if you have veneer tops in bad shape does annie sloan still work and also laminate cheap laminate with particle board worth painting over. Nice job on on desk! I just saw your reply thank you for that. A month ago I did a night stand and some old interesting small table that was left for dead in my attic. Using ASCP , I did old white on night stand and blue duck something on other piece. The painting went well, I did discover not to go over painted area like a wall it begins to pull or distort paint. After drying no issue. Ok time for my real problem. Waxing ooooh waxing to much to little brush strokes are seen. Use a cloth to apply or use a AS wax brush…….. On one piece I used to much wax, I believe and buffed and buffed days later not sure if it changed anything. I was expecting the wax to make or have a slippery feel after drying with no brush strokes visible. It was very stressful for last week or so, thinking I failed at first waxing. Shouldn’t waxing piece be relaxing and fun? Please let me know how to wax and relax! Next job is rocker (Paris Grey) and hopefully shaker tape seat. Then a dresser/amoire with lots of detail. Really, really awesome job. I have yet to use Annie Sloan but I am looking forward to it. I can’t wait to use her Barcelona Orange and paint some awesome piece of furniture with it!!! Love your blog. That looks fantastic! Great makeover! Thank you for joining Home Sweet Home! I’m visiting today from DIY Showoff. I hope you get a chance to visit my blog, too. I’m co-hosting the DIY Sunday Showcase and would love for you to come by and link up! Open Now! DIY Showcase ~ Come Link Up! Looks great especially under that poster! It was a great game! If you ever come to Wilmington while in Southport, I would love for you to see the historic1910 cottage we are redoing.